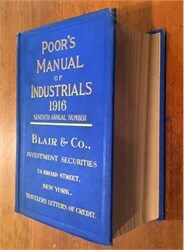 New York, NY: Poor's Industrials Manual, 1916. Hardcover. Good. Complete but shows signs of wear. 9" x 6". Showing Stocks, Bonds, Debts, Cost, Traffic, Earnings, Expenses, and Dividends, their Organizations, Directors, Officers, etc. First published in 1868. Henry Poor's Industrials Manuals were an early form of business analysis that allowed investors to research the growth and financial health of companies. This 1916 edition includes 3112 pages, with fold-out maps of different lines. Large blue cloth volume is lightly separated spine, corners lightly worn and starting to fray a bit. All pages intact.